This lesson covers dishes that are especially suitable for vegetarians, but can be enjoyed by all. 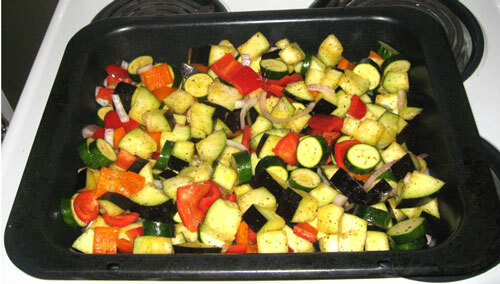 Some make tasty accompaniments to meat and vegetable meals, as your carb portion. Following a vegetarian diet, or especially a vegan diet that excludes all animal products, can lead to a number of nutritional deficiencies if not carefully balanced. For those people who do choose a vegetarian diet, there are ways to maximise the nutritional value of the foods eaten. Some dangers are lack of protein, not enough of the right fats with their vital fat soluble vitamins (A and D), and too high a level of carbs. It can be difficult to get enough iron and zinc. Vegans must supplement with B12 as it is only present in animal foods. Fish is a good source of both protein and fatty acids (see lesson 8). But many species are now contaminated with mercury. In general, those higher in the food chain have a higher concentration of mercury, for example shark has more mercury then sardines. You can download a full list here of NZ fish varieties and their mercury levels. Dairy products and eggs supply protein plus fat soluble nutrients. If you can source raw dairy, this is far superior to pasteurised and homogenised, as long as it’s from a source you trust. Otherwise, cheeses or cultured milks such as yoghurt or Kefir may be tolerated better than milk. Choose full fat products. Butter and cream can often be tolerated even by those who can’t eat other dairy. They provide fat soluble vitamins in an easily used form. If even these donlt work for you, ghe (clarified butter) may. Raw egg yolks are very beneficial, as long as they are free range. If you are strictly vegan, you can get saturated fat from coconut products. If you need to control your carb intake, this can be a problem. It used to be thought that you needed to combine different plant groups at same meal to make complete protein. But it’s now thought that as long as they’re eaten on the same day, it’s OK. So if you’re eating some animal protein, aim to eat a serving of each of the groups once a day. If you’re vegan, eat 2-3 serves from each group a day, and aim to combine 3 at least once a day. One last thing that needs to be covered. Soy foods tend to popular with vegetarians, as they have the highest protein of any legume. Unfortunately, unlike other legumes, they have anti-nutrients that are not neutralised by soaking, only by fermenting. Unfermented soy products such as soy milk, tofu, soy cheese, soy sausages and patties, protein powders, and soy in supplements have been associated with a wide variety of serious health problems (see extra reading below). So it’s best to limit soy to small amounts of fermented products such as tempeh, natto, tamari and miso. Try as many of these recipes as suits your lifestyle and metabolic needs. Nut roast. This is a popular vegetarian dish, especially for holidays or other occasions when a roast is traditionally served. It can be served hot with vegetables, or a side salad, and a yoghurt or tahini sauce. Or it makes a delicious and convenient lunchbox snack. Soybeans: Soaking doesn’t neutralise anti-nutrients. Only eat fermented soy products. Soak 8-24 hours (or even longer is OK) in warm water with an acidic medium added (whey, kefir, yoghurt, lemon juice, etc). Drain, rinse well, add fresh water and simmer till cooked. Add salt after cooking, as adding it earlier can make them tough. See chart below for times.